Think about it... If you ever find yourself up there in front of the room, giving talks or presentations lacking in confidence, expertise, or charisma... You don't lead. You don't convince. You don't sell. Bottom line: Bad talks are bad for business. In this one-of-a-kind "Learn & Affirm" audio you will not only learn eight powerful strategies that will give you the ability to speak with poise, power, and pizazz in front of any audience, but by using Stan Munslow's proven "Learn & Affirm" process, you will learn these strategies faster and more effectively than you ever thought possible. Acquiring the skills to speak before others with total confidence will not only eliminate the unpleasant symptoms of stage fright, it is the answer to just about everything else that will make you a more successful speaker. Things such as: Strong, articulate voice-quality. Improved poise and appearance. Powerful, engaging, convincing delivery. Connection with your audience. If your work demands the best from you as a speaker, these are skills you can't afford to pass up. 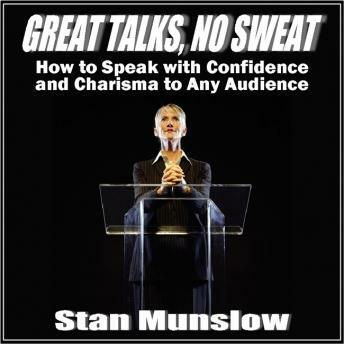 Get "Great Talks, No Sweat" today!